Drag the slow barge, or drive the rapid car. A more beautiful entrance to a church could not easily be found anywhere than is to be seen here. On each side the ground is cultivated with roses and flowers, and presents a lovely appearance. The church of All Saints, which lies away in the background, contains a number of monuments to the Darwin family. There is certainly nothing interesting in the architecture, the monuments mentioned being the special feature. The ancient chapel, now disused, amply repays the visitor to this quaint little village. It will be a long time before the members of the Thoroton Society forget what was asked of them by the old gentleman who evidently rents the field in which the chapel is situated. As they approached he begged of them to pay respect to him by walking in single file across his growing hay. Needless to say his order was obeyed. On arrival at the fine old structure, Mr. Blagg gave an interesting account of the building. 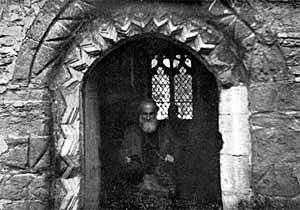 He stated that the chapel was erected for the convenience of the inhabitants of certain houses within the lordship. Tradition said that at one time it stood at Stoke, near the spot at present occupied by the vicarage, and this appeared to be borne out by the occurrence of fragments of mouldings and carved stone in the wall of the present fabric, which had apparently been incorporated in the structure when the walls were rebuilt. 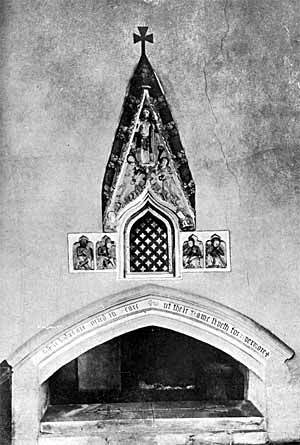 Further, the date 1577 occurred on a stone over the east window on the outside of the building, and again inside the chapel on the north wall, near the pulpit, and as this date was necessarily something like 400 years later than the fine 12th century doorway with its Norman arch and zig-zag mouldings it was possible that that was the date at which the chapel was removed and rebuilt. It might even at one time have formed part of the buildings of the hospital at Stoke, a religious foundation of some antiquity which was disestablished shortly before the date mentioned. There are fragments of stained glass in the upper panes of several of the windows, but none of it armorial. There is a bellcote in the western gable containing one bell, plain and uninscribed; a toothless looking gap showing where the second hung, but the villagers say it was cracked and so sold by the chapel wardens for old metal. Although services have been discontinued for about thirty years, chapel wardens are still appointed, and the rent, derived from the field in which the building stands, more than suffices to keep it weather tight and clean. The chapel possesses its own register, which dates from 1584. Old stone dovecote at Sibthorpe. 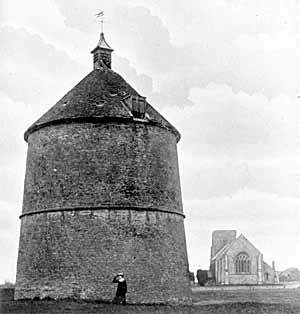 The next village visited was Sibthorpe, where the church of St. Peter and a mediaeval dovecote were the two objects of interest. In earlier days there was a college of priests attached to the church, founded in 1320 by Geoffrey le Scrope, and a few years later augmented by Thomas de Sibthorpe, the good parson of Beckingham. In this college, Thoroton tells us, was "a Warden, being a secular Priest, and eight or nine other Chaplains, and three Clerks or more, some to sing Trebles, or small, like Boys, to help them to officiate daily in the Church of St. Peter at Sibethorp and in the Chapels of St. Anne, St. Katherin, St. Margaret, and St. Mary Magdalene, in the same Church, for the souls of King Edward the Second and his heirs," etc. It was endowed with lands in this and the neighbouring parishes of Syerston, Elston, Thoroton, and Aslockton. 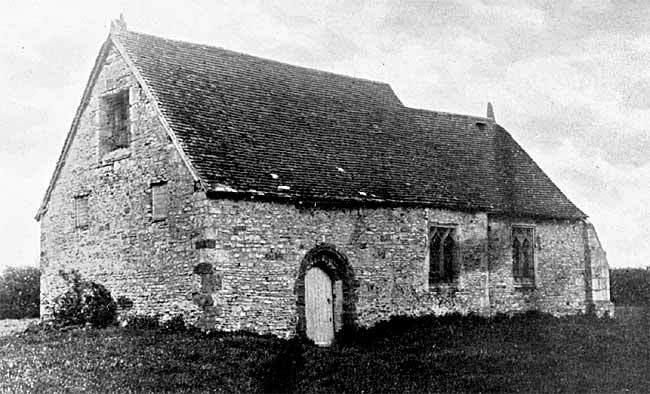 No traces of the college are left, except the fish-ponds on the south side of the church, and the dovecote, unless this as some suggest, is later work, in which material from the old buildings was used. The western tower of the church is of the Early English period, viz. : about 1200, and has three stages, the lower one with a double moulded arch, and a modern west doorway, above which is a long narrow window looking like a lancet with the apex omitted. There is also a lancet window in the lower stage of the south wall of the tower. The upper story has a window of two lights on each face under a moulded arch. The brick parapet with which the tower is furnished, and the fine chancel arch resting on detached columns and with its capitals foliated are also of the Early English period. The rest is in the Decorated style, and originally consisted of a nave, with north and south aisles, and a chancel with sacristy on the north side of the sanctuary. In 1662 the aisles of this church seem to have been taken down, the northern arcade built up and two decorated windows with their tracery inserted in the arches. Of the southern arcade nothing is left, but a wall built further south to make a wider nave. The chancel is a fine specimen of the Decorated period. The east window is of five lights, the centre one being taller than the rest with a quatrefoil above it. There is also a north window and three fine south windows of three lights each. On the north side is an Easter Sepulchre, the painting of which is said to have been restored some years ago by Mrs. Miles of Bingham. The form of this sepulchre is especially interesting as being an example of transition from the many movable sepulchres of wood to those beautiful, wrought-stone examples of tomb and arched recess, which have been preserved to us at Hawton and Arnold in this county, and at Lincoln, Navenby and Heckington in the county of Lincoln. At Sibthorpe is to be found over an arched tomb an ogee-headed recess, on either side of which are two small panels with a Roman soldier in each, clad in chain mail, surcoates without sleeves, and bascinet-shaped helmet worn by the English infantry in the reigns of Edward the Second and Edward the Third, and triangular shields. Springing from two half-figures whose hands are joined in prayer, is a pediment above the ogee, with crockets and finial, and in the spandrels of this pediment is a figure of our Lord with His right hand uplifted in blessing, and His left hand carrying the cross, while at His feet, one on either side, are two adoring angels. The east window has its central light, now filled with stained glass, the apex-part depicting a pelican with her young, below which there is a picture of the Crucifixion, with S. John and S. Mary standing on either side of the cross; and in the lower compartment, the brazen serpent is represented as raised on the cross in the wilderness, and our Lord as teaching the lesson of S. John iii. 14. At the foot of this compartment is the following inscription:—"To the glory of God, and the memory of Richard de Sibthorpe, the good parson of Beckingham." The south side of the sanctuary possesses two piscinas, the one to the west being below the east end of the sill of the south window, a portion of sill and walling above this second piscina being cut away to make the requisite room. Double piscinas are not infrequently to be met with, and perhaps point to the use of one for cleansing the hands of the priest and of the other for cleansing the sacred vessels. Another piscina may be noticed here on the outside of the present north wall of the church and towards the east end of the nave. On the north side of the chancel, now lying between the Decorated window and the present vestry door, is the alabaster tomb of Edward Burnell. The wrought effigy is life-size, and recumbent, with the head resting upon a large book, probably representing a Bible, and the hands are placed together in the attitude of prayer. The monument has the two following inscriptions;—"Edward Burnell gt, departed this present world the xix of december in the yeare of our lord 1589," and "Made anno dni 1590 by me Barbara Burnell, God grant us a joyful resurrection." This Barbara was previously the third wife and the widow of Richard Whallaye, of Screveton, to whom she erected the alabaster tomb now under the tower of Screveton Church. Before the restoration of Sibthorpe Church, some fifty years ago, this Burnell monument blocked up the western portion of the founder's tomb, and Throsby speaks of the tomb as being in that position in his time. A drawing of it, so situated, has been published by the "Anastatic Drawing Society." The incised cross as now seen on the founder's tomb is modern. The font is dated 1662, and has also the letter W inscribed within a lozenge to the left of the date. The panel-work pattern on the bowl of the font is to be seen also at Scarrington Church, and fonts of the same type of ornament are to be found at Whatton and East Bridgford churches. The four bells were recast by Taylor, of Loughborough, in 1893. Their earlier dates are also inscribed on them, viz. : small bell, 1622; second, 1623; third, 1622; large bell, 1622, and the old legends seem to have been also retained. They run as follows:—(1) God save the King; (2) God save the Church; (3) God save His Church; (4) All men that heare my mornfull sound, repent before you lye in ground. This large bell also bears the names of the present vicar, R. J. Weatherell, and the wardens for 1893, Richard Fox and Edmund Storr. The registers date from 1720, the earlier ones having been lost. The church chest also contains one or two parish transfers and a few leaves of an Act of Parliament, 16 Geo. III. "to enable His Majesty for a limited time to call out and assemble the Militia in all cases of Rebellion within this realm of Great Britain." The text of the Act is printed in a modern kind of black letter, and refers to the utility of embodying the Militia "upon Occasion of the Present Rebellion in America." Thomas Seeker was born here in 1693. He was successively Bishop of Bristol in 1735, Oxford in 1737, and Archbishop of Canterbury in 1758. He died in 1768. Canon Perry speaks of him as a plain man and no courtier. Hence he had but little influence in Church politics, but he did good service by checking extremes, by setting forth a pattern of plain Christian teaching, and by stimulating activity and earnestness among the clergy. "No man probably was better abused in his day, but that which drew upon him the fulness of the wrath of the careless and the loose thinkers was the honest attempt which he made to plant bishops in our American colonies." Porteus in his life of Seeker says:— Posterity will stand amazed when they are told that on this account his memory has been pursued in pamphlets and newspapers with such unrelenting rancour, such unexampled wantonness of abuse, as he would scarcely have deserved had he attempted to eradicate Christianity out of America and to introduce Mahometanism in its room." He was the son of Thomas Seeker, of Sibthorpe, the entry of whose marriage appears in the neighbouring Shelton registers as follows:—" Thomas Seeker was married to Abigail Brough December the 18th 1689." From Sibthorpe the party proceeded to Staunton, and lunched in a large marquee erected in the park. Among those present were:—The Rev. A. J. Bennoch and Canon Cator, Messrs. G. Harrison, C. Gerring, W. J. Hannah, G. Hore, W. B. Thorpe, J. H. Hayward, W. F. Fox, W. Bradshaw, F. R. Pickerill, A. Ward, James Ward, George Fellows, T. K. Gordon, F. A. Wadsworth, J. Warren, H. Ashwell, J. Thorpe, R. Whitbread, R. Mellors, W. B. Cooke, T. M. Blagg, J. C. Warren, W. Scorer, G. H. Wallis, J. T. Radford, W. P. W. Phillimore, and the Rev. J. Standish. The rector, the Rev. F. J. Ross, joined the party at luncheon and afterwards spoke briefly of the many interesting features of the parish, the church and the hall.